From the Carradice Originals range the Barley saddlebag is made from 100% waterproof 18oz Cotton Duck & is available in two colours. The buckles & fastenings are all metal whilst the straps are made from chromed leather, which means they keep their strength & looks no matter what weather & conditions they face. All Carradice Originals bags come with a lifetime guarantee against defective materials & workmanship. thanks to sjs for great service. I have always liked the classic look of the Carradice saddle bags and I bought the Barley as I already own a Nelson, that I use while touring and on longer rides, and wanted something smaller for daily use. It is the perfect commuting size, good looking and well made (by Emma, according to the lable). Minor niggle is the side pockets, I would be happier if they sealed a bit better. The flap only really closes on the last hole of the strap and there is still a small gap that I'm worried things may escape from. Having said that nothing has yet but I don't put house keys of important stuff like that in them. After much searching my husband decided this was the saddlebag he wanted. It is perfect for his needs and gets rid of the awful rucksack! Will be buying a bag support though as if the bag is loaded it loses a bit of stability. Excellent service SJS despite Royal Mail's attempts to lose the parcel. Perhaps using a different carrier would be the way to go in future? Loveee it... Just cool and nice with my Brooks saddle. I live in Indonesia and bought this saddle bag for personal use. Thanks SJS for your great service. Absolutely love this saddlebag. Perfect for a long day ride, and great for commuting. Deceptively spacious. I can easily fit a change of clothes, tools, spare tubes, phone wallet keys etc and have space left over. Excellent quality, they last forever judging by those my friends have. Glad I made the investment. I'd recommend buying a Carradice Bagman or SQR support at the same time, it makes a big different to comfort and practicality. 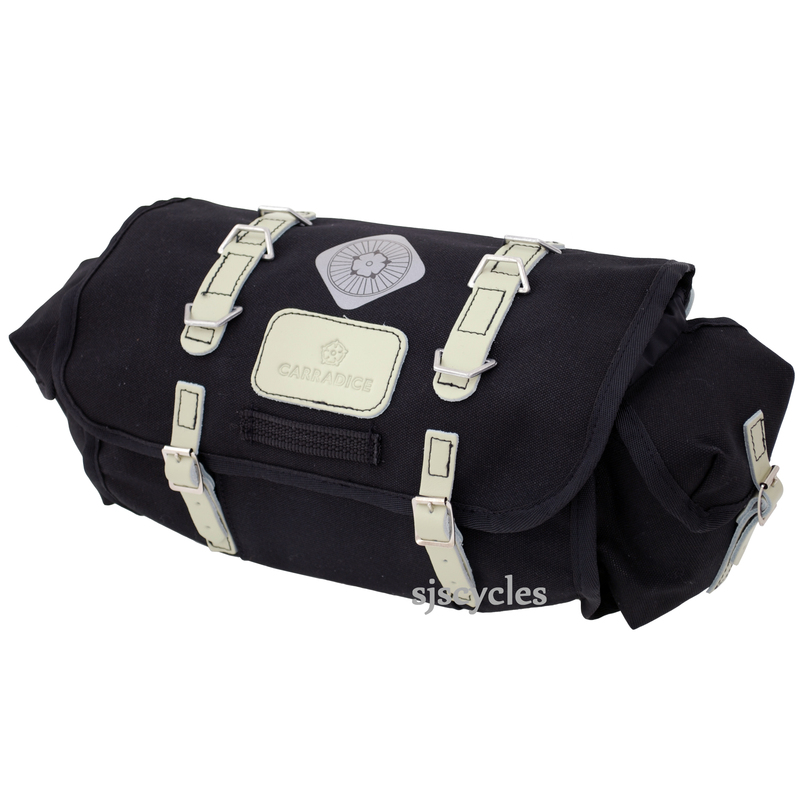 Great saddlebag perfect size for a day ride. Very well made product, which should last decades with proper care. Looks great with your Brooks saddle. Nice to see that there are still some quality items being "Made in England"!! My advice is buy one now before some idiot has the great idea of having these made in China. Where it will ruined forever!!! Well done Carradice and thanks again SJS for providing great service and value. Will Carradice Pendle Saddle Bag Flap About? I like the look of the Pendle but need to know that it won't "flap about" when on rougher surfaces. How is it fixed? This Pendle bag is attached by 3 leather straps, two directly to the saddle (either rails or bag loops) and one around the seatpost. This holds that bag fairly well, but if loaded fully it will be able to move around slightly. Carradice offer a few solutions for supporting heavily loaded saddle bags in the form of their Bagman support and their uplift system.